© 2016 R.L. 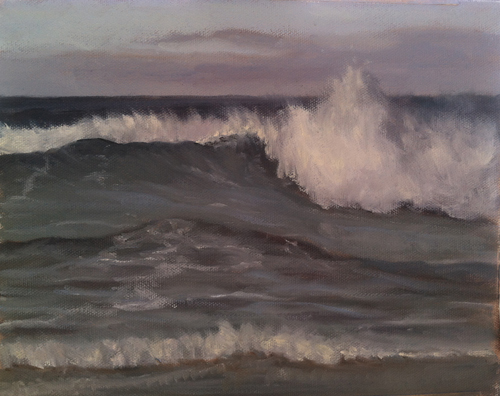 Delight Fine Art, Wave Study #89, 8"x10", oil on canvas, plein air. November and December were rough months weather-wise with storms, flooding, landslides, sink holes, icy roads, and snow in the passes. January, on the other hand, has been a lovely month so far. I get my daily exercise by walking up to the north end of our beach where Neahkahnie mountain juts out into the ocean. I love that area not only for the chaotic waves but because more often than not, the mountain shelters you somewhat from the winds. When it isn't wet out, I throw in my sketchbook and do a quick sketch when I reach the foot of the mountain before turning around to head back home. It is about a mile or so from my door to my favorite spot. The waves the past couple of days have been so wildly beautiful, as they usually are this time of year. Upon checking the weather forecast for today, I decided to get in another plein air wave study. The forecast did not disappoint as the weather was perfect. It was fairly warm with very light winds. The sun was out most of the time. I am so close to the final ten studies to complete one hundred plein air wave studies. It will be fun to look back at the first wave studies and compare them to the one hundredth one. I took my time on this one, trying to get as much information as I can. After the hundredth study, I might want to break the wave studies into their elements and paint several studies on foam, some on swells, some with the waves from the side, etc.. Yes! I will be continuing the wave studies after the initial one hundred! My studies are painted with almost all with the waves coming directly at the viewer. 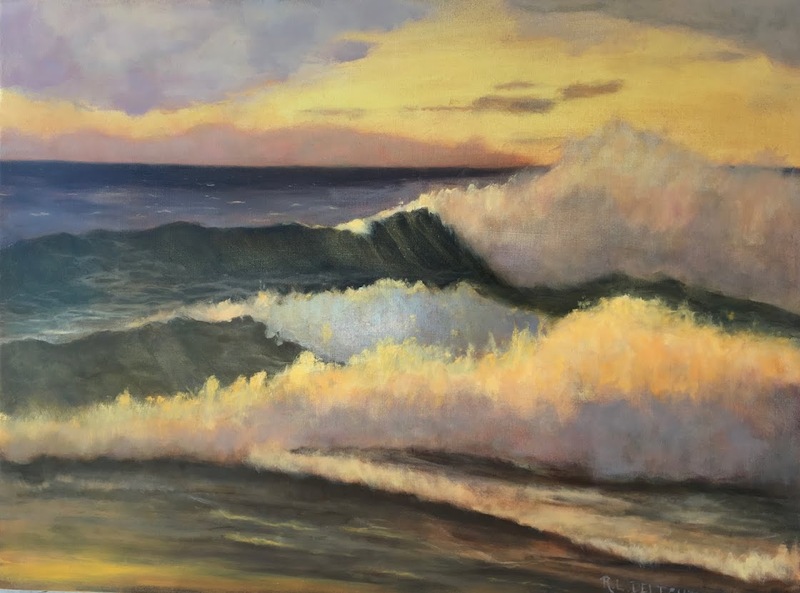 I have done it that way mainly for two reasons: One, I wanted to keep things relatively simple to get a handle on painting the waves and two, I have to drive down the highway a ways to find a beach that allows a safe view of the waves from the side. I like to be able to see the waves coming. "Never turn your back" is the golden rule of the beach. I have seen too many people pay the price for inattention. Here is a final shot of the day, fully set up and ready to paint! Wow, leaps and bounds from those very first studies! The colors are just awesome. Your wave studies have paid off!